After a person has been hospitalized, they often feel gratitude toward the nurses and other staff who took such good care of them. The patient may or may not be able to express that gratitude in words before leaving the hospital. However, it can be expressed in a more tangible way with a special gift for the hospital staff. Follow hospital regulations regarding any thank you gifts you wish to give hospital staff. Grateful patients often like to thank hospital staff for providing good care. Flowers brighten up the nurses' counter or back room of the hospital staff and are much appreciated as a thank you gift. This is especially true if most of the nurses and others who provided care are women. Instead of a vase, which could get knocked over and broken, use a basket as a base. Include in the arrangement something that ties to the reason you were in the hospital. Add a pair of baby slippers for the maternity ward, a crutch for orthopedics, a heart for heart surgery or other appropriate item. Attach a card of appreciation. If one person stood out during your hospital stay, whether that is a nurse, therapist, nutritionist or a housekeeper, a single rose in a beautiful vase is appropriate. 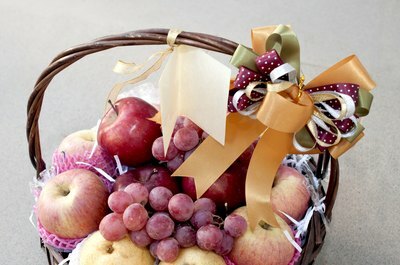 A small basket of fruit or candy would also work as a heartfelt gift of appreciation. Balloons are an alternative to flowers as a thank gift for hospital staff. Helium balloons are colorful and add a touch of fun to any environment. You don't just have to purchase a single balloon. Many business that sell helium balloons also put together balloon arrangements appropriate for any occasion. Add a thank you message on the balloons as well as in an accompanying card. Hospital staffers enjoy flowers and balloon arrangements as thank you gifts, but they also appreciate food they can consume on the premises. Buy and wrap a large box of assorted chocolates. Attach a colorful bow with a miniature bottle, crutch or other appropriate symbol of your hospital stay. Include a card expressing your gratitude. If at all possible, present your gift to the nurses yourself. A basket of fruit is another appropriate gift for the hospital staff. Make sure the fruit is something that can be easily consumed on the job such as apples, bananas, oranges, peaches or whatever is in season. Decorate the basket and tuck a thank you card into the basket along with the fruit. You may also want tp give a basket of gourmet coffee and chocolate. Be sure some is caffeine-free. What is the Telemetry Floor?